This isn’t seasonal (because the tomatoes in question were hydroponically grown in a greenhouse, and also because tomatoes aren’t due for another two months) BUT it is local. 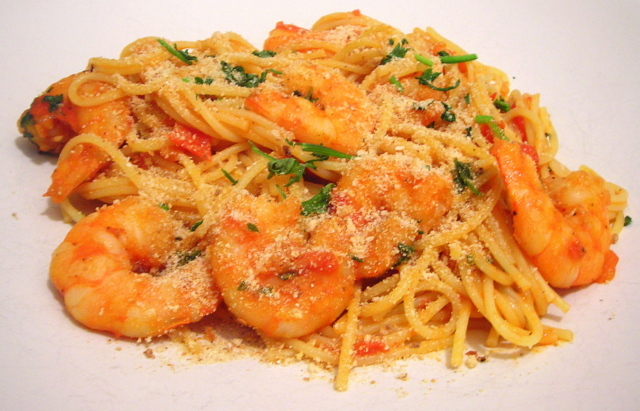 The shrimp were caught from Long Island Sound on Wednesday morning, and everything with the exception of the pasta, the breadcrumbs and the salt came from Union Square Greenmarket. At least it doesn’t completely break the boundaries of this foodblog. This took 20 minutes from start to finish. Per serving, it also costs less per person than the price of a comparative fast food meal. When you can make dinner in TWENTY minutes, it really begs the question as to why someone would buy a Big Mac from McDonald’s. Sprinkle shrimp with a pinch of salt and set aside for 5 minutes. Meanwhile, set a pot of water to boil, then add pasta and prepare according to package directions. Melt 1 tablespoon unsalted butter over medium heat. Add garlic and sauté until garlic takes on a little color, about 30 seconds. Add shrimp to pan. Cook, stirring occasionally, until shrimp turn a bright orange on all sides, about 2 minutes. Remove from heat and set aside. Add tomatoes directly to the pan, turn heat to medium-high. Cook until tomatoes disintegrate and form a chunky sauce. I added another tablespoon of butter to round things out. Return shrimp mixture to pan and taste for salt if necessary. Cook until shrimp are heated through, about 2 minutes. Remove from heat. Drain pasta and add to pan. Toss together to incorporate. Stir in parsley, sprinkle a couple of tablespoons of fried breadcrumbs and serve immediately. The breadcrumbs are optional (you can substitute cheese if you like although the conventional wisdom in Italian food when it comes to seafood sauces is to omit cheese entirely); I usually keep a container of fried anchovy-flavored breadcrumbs on hand for just such an occasion. Time: 20 minutes, including prep. 16 Apr	This entry was published on April 16, 2010 at 2:11 pm. It’s filed under food, general, Italian food and tagged cooking, dinner, local, quick and easy, shrimp, slow food, spaghetti, tomatoes. Bookmark the permalink. Follow any comments here with the RSS feed for this post. I stuffed red peppers with whole wheat thin spaghetti, roasted cauliflower, sunflower seeds, grape tomatoes, tomato paste, onion, and smoky cheddar cheese last night. Thought of you. i love pasta, somewhat because you can do so many things to it and with it. I too like pasta but I’m less interested in the usual preparations — bolognese, carbonara, vongole, amatriciana, etc. I feel those dishes have been done to death. This isn’t to say that I won’t ever prepare them. At least one classic dish has appeared on this here foodblog thingy. It’s just that I like to explore dishes where other ingredients are highlighted and where the pasta is a supporting player rather than the star of the show, if that makes any sense.